Making strides in a mission to achieve public wellbeing through proper sanitation, ‘HarpicSuwa Jana Meheyuma’ (Mission Wellbeing) recently completed renovating the public toilet facility at Sri Pada and handed it over to authorities for public use. The timely initiative was carried out at the start of the Sri Pada pilgrimage season to meet the sanitation needs of thousands of local pilgrims and foreign tourists who will visit the revered venue in months to come. Sri Pada has been a prioritised location in the Harpic CSR calendar this year, and the brand has conducted multiple CSR initiatives in numerous locations in the past to provide relief to pilgrims. Under the recently concluded initiative, HarpicSuwa Jana Meheyuma completely renovated the facility near MakaraThorana at Sri Pada and converted it to a clean and hygienic facility that caters to the thousands who visit the place. After renovations, the Reckitt Benckiser management handed over the facility to the MaskeliyaPradheshiyaSabha for maintenance and Harpic will continue to support the maintenance throughout the season. 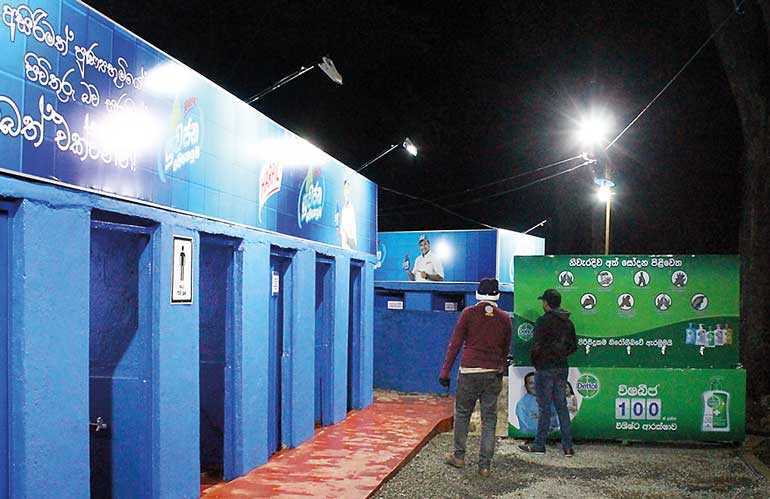 “As one of the leading hygiene brands in the country, Harpic has aligned all CSR efforts under ‘Suwa Jana Meheyuma’ to provide the public with important sanitation facilities and education on hygiene. Our CSR projects range from building and renovating sanitation facilities, to providing mobile sanitation facilities and door to door educational campaigns, conducted throughout the year and around the country. The prime objective of Suwa Jana Meheyuma is to create a social movement towards improved public sanitation. It is a pleasure to notice that our consistent efforts are bearing fruit whilst as a brand we connect with our consumers in a more meaningful way,” saidReckitt BenckiserHead of Marketing and Trade Marketing Jude Martino. “We are grateful to Harpic for this generous and timely initiative to renovate public sanitation facilities at Sri Pada. Also, it is important to note the impressive commitment Harpic has shown to pilgrims around the island over the years. We have seen millions benefitting from their efforts. While we thank Harpic and Reckitt Benckiser for this initiative, we would like to reiterate our commitment towards maintaining this facility in a good condition for the benefit of all pilgrims,” said Maskeliya Pradheshiya Sabha Chairman Senbagavalli, commenting on the Harpic initiative. Since the launch of ‘HarpicSuwa Jana Meheyuma; Mission Wellbeing’ in March 2017, Harpic has carried out multiple CSR projects aimed at elevating the status of hygiene among Sri Lankan communities. “2019 is a significant year for HarpicSuwa Jana Meheyuma and Sri Pada is only the first of a long line up of projects for the year. Through various Suwa Jana Meheyuma initiatives such as providing sanitation facilities to households and communities, mobile toilet facilities that cover all of Sri Lanka’s major religious and cultural events, we are aiming to benefit approximately 1.5 million people around the country this year. Harpic will be committed to this cause, channelling Rs. 5 from every 500 ml bottle of Harpic Bottle sold,” commentedHarpic Senior Brand Manager ChathurikaFonseka.